Reflecting on the meaning of today's feast (and could it merely be a coincidence that of the twenty-something local teams they preview, the Chicago Tribune featured the Fighting Irish today? 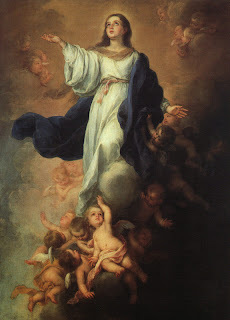 ), we see the intimate connection between the (Immaculate) Conception and Assumption, the beginning of life and its completion. Mary's initial "yes" to Gabriel, to life (and what a life it was, previewed by John's in-womb "Jump for Joy! "), was THE significant step to Her season-ending (that is, her life on earth) crown of glory. So the message to so-called Catholic and/or Republican social justice yet pro-choice politicians is that without a beginning, there can be no middle to be concerned with. I bring this up because in today's news, Newt Gingrich is set to join the presidential fray with other soft-on-life Republicans like Giuliani and Romney, by purporting to be (unlike his old friend "W") a tough guy on illegal immigration. Well, I suppose illegal immigration is a tough issue and there is no clear-cut solution about what to do about it (or the estimated twelve million illegals already in our country), even among devout Catholics. But the fact is, that whether it was through kidnapped slaves, twelve-year-olds working twelve-hour-days, or now illegal immigrants, capitalism and exploited cheap labor have always gone hand-in-hand, and if there wasn't someone hiring those illegals, they wouldn't be coming here to live. If we had cracked down on their employers, just as we once cracked down on slave owners or factory bosses, the problem would not exist. But as G.K. Chesterton said at the turn of the century, the reason the politicians are so eager to give the poor the right to divorce but not the right to a drink, a deed to a house (or basically a right to anything else) is that strong families with an actual voice in the country's affairs is the only thing that keeps capitalism from controlling the state. Illegals, like slaves or child labor, are basically voiceless, unable to vote or, due to fear of deportation, press for fair wages or workers' rights. With this understanding of capitalism, you can see that abortion is also its close ally, for abortion leads to unstable unhappy families, exactly what capitalism needs to keep its cheap labor stranglehold. By not paying a living wage, the capitalist (now with the help of the state) convinces the poor employees they have no choice but to abort—as even adoption requires paperwork and "discovery." So when Barack Obama says he is focused not on abortion but "uniting" social issues such as health care and raising the minimum wage, he is missing the point. Not only are the issues intimately connected, but the other issues must (if they are to promote strong families) by reason of natural law rely on the first. Now I am with Barack in that no one who has ever tried to raise a family on six- or seven-dollar-an-hour jobs is against raising the minimum wage. But if my employer said, "I'm gonna double your salary from minimum wage to fifteen dollars an hour, but only if you divorce your wife and abort your baby because there's no way you could do this job with that kind of divided commitment," I don't have to tell you what the correct answer to that question would be. Thus, Obama's wage-raising, abortion-choosing platform is promoting single, divorced, gay or "DINK-y" lifestyles at the expense of family, and Gingrich's "round 'em up but let 'em abort" approach betrays the capitalist-controlled morally-corrupt man that he really is. And yet, in a capitalist system where money seems to control everything from our candidates to our morals, it is heartening to see Mike Huckabee and Sam Brownback finish so strongly in the Iowa straw poll. Of course, Mitt Romney and his millions "bought" the poll position but Huck and Sammy finished 2nd and 3rd in this heartland contest, bringing Our Lady's hope into the process. 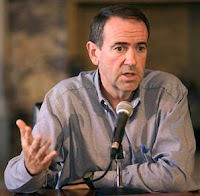 Vowing to provide the deciding Supreme Court vote to end legal abortion, Brownback proclaimed, "You can raise a good child in a single parent environment ... but the best place to raise a child is between a mom and a dad bonded together for life," while Huckabee, the other strong pro-life candidate, took a shot at the wealthy Mormon's political machine by saying, "I can't buy you ... I don't even have the money to rent you. But today the straw poll was not about electing a straw man." Our Lady succeeded because she said yes to a Man who was not afraid to speak the truth and was willing to lay down his life (and all the glory that accompanied it) that others may live. So on this day we celebrate a woman whose body and soul did not decay, may we vow to back only men like Huckabee or Brownback, who will not wilt like straw when promoting God's Law over man's. Alas . . . alas . . .
We are a country of gone to materialist concerns not so much at slave wages but wit millionaires' appetites. We don't even have the basic sense to see that even if those were 'satisfied' for the hour or day, then we'd have billionaires' appetites to ride herd on us. Even our Church is infested - how many homilies seem driven by the collection plates as contrasted to those exhorting for the lives of the unborn, or Sacramental integrity of Matrimony. And, we certainly do NOT mention those untoward appetites. Once again you're on target. And what do Pro-Choicers think about the un-born John's joyful acknowledgement of the Savior? Catholic Answers already is hitting the presses(http://www.caaction.com/index.php?option=com_frontpage&Itemid=1) about the 2008 election with voters' handbooks on the big five issues: abortion, euthanasia, embronic stem cell and cloning issues and homosexual marriage. Up front, I'm considering ordering a hundred English Catholic handbooks, and fifty Spanish Catholic handbooks to stick in the pamphlet rack at St. Domitilla's. And maybe pony up some cash to support other further distribution.